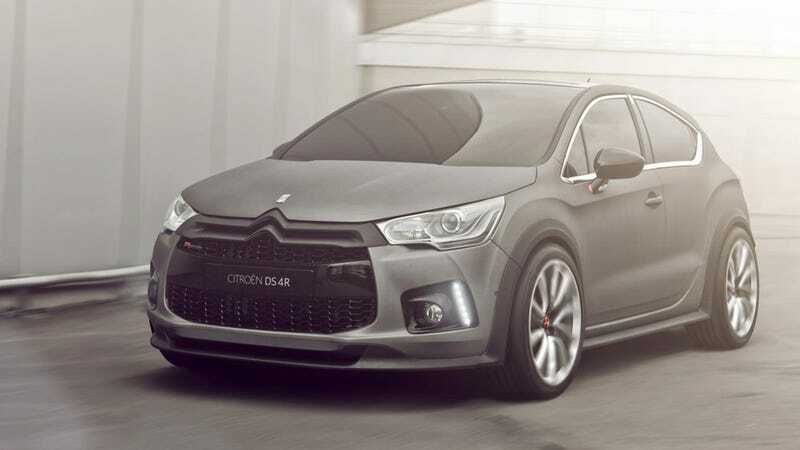 This is Citroën's new, plush, designer hot hatch, the DS4 Racing. It's built by the French brand's motorsports division, who have absolutely dominated international rallying for the past seven years, and it shows that Citroën is in a strange place right now. If you make your way to Europe, the Citroëns you're going to find aren't the strange, elegant cars of the past. You're going to see beat up hatchbacks from the ‘90s, either with a grandma behind the wheel, or a teenager loving his car's very tacky bodykit. Citroën is trying to drag itself out of its bargain-basement image, and this 256 horsepower hatch "concept" is just one part of that effort. Like its little brother, the DS3 Racing, the DS4R has a 1.6 liter turbo four, bigger wheels (19 inchers), bigger brakes, lowered suspension (35mm), widened track (55mm at the front 75mm at the rear) and more tire all around. We'll never see them here in the US of A, but that doesn't stop us pining for one of these leather-lined, hatches, even if a Renaultsport Megane probably drives better. Expect to see more of its matte-finished skin at the upcoming Geneva Motor Show.